The sight set off a trigger in me. Our culture has convinced us that whatever doesn’t look like it is doing much – isn’t worth much. But wait…with the click of a mouse, the internet enlightened me when it comes to turtles. Those little critters are integral to the ecological balance of the planet. There are whole societies set up to save them! 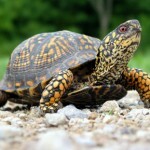 Turtles play their part on planet earth while simply plodding along. Who knows if I might be balancing out a storm brewing on the other side of the world? What a startling image for those of us type A’s! “That’s all he does.”…and yet…he IS, fulfills his destiny, is suppoted by and supports the Universe and brings amazement to us mortals! Thanks for my very profound thought for today! Thanks for reminding me that we win the race by just ‘Being’! Hi Debra. May I suggest the book “When the Heart Waits,” by Sue Monk Kidd. I think you’ll love it, especially the chapter, “Concentrated Stillness,” where she talks about doing something as irrelevent as watching a spider, the quietness of it, the stillness of it. “Funny how God strews our paths with little webs of grace that pull us into the prayer of waiting,” she says, “into healing and rebirth.” Lovely stuff. We are on the same page Margaret. I read this book last year and loved it. In fact, I have a quote from Sue Monk Kidd I hope to use to open a chapter in mine. Her story is beautifully written. Love the Zen feeling of the three stones.” along with blue and green of nature..so congruent with your topic. LOVE IT.. I too am a fan of Sue Monk Kid- ” Dance of the Dissident Daughter ” being a favorite. Congratulations again**so gald we shared a class together and are sharing the Texas sky. I”ll be looking for your book!!! Your comment is so appreciated Sarmita. It feels good to hear the blue green colors and 3 stones (body, mind, spirit) are conveying the sentiment behind my message of rest. Thanks for the smiles! Congratulations again**so glad we shared a class together and share the Texas sky. I happen to love green sea turtles, a love that developed after swimming with them in Hawaii in 2004. I bought a ceramic one as a reminder and because of this information attached to it: “The rhythm of their lives is peaceful and calm, perhaps this is the secret of their longevity. In our frantic, fast-paced lifestyle, the Honus (sea turtle) points to a more satisfying way of life.” I’m striving to live “this way of life” myself. Swimming with the turtles sounds like the perfect antidote to stress. Thanks for sharing the possible connection between the way of life of the turtle and a long life of serenity. I normally don’t write comments on posts, but your post urged me to commend your writings. Thanks for writing this, I’ll surely common your internet site and occur back as soon as in awhile. Happy blogging.